Samantha Power, US Ambassador, stated “We voted against this resolution not because we are comfortable with the status quo. We voted against it because … peace must come from hard compromises that occur at the negotiating table.” Such is the view of the broken broker. Hard compromise? negotiating table? Whose compromise and which table? No matter, we, in the international community, have a conscionable duty to support any and all political actions to establish this call for a 2017 internationally recognised Palestinian State. The treaty “deals with essential aspects of the life and activity of the Catholic Church in Palestine.” Unsurprisingly the treaty drew criticism from Israel, one official declaring “Such a development does not further the peace process and distances the Palestinian leadership from returning to direct bilateral negotiations.” Peace process? Sixty seven years of a protracted peace process with no end in sight! Bilateral negotiations? What about Israel’s decades long unilateral un-negotiated policy of land appropriation, house demolitions, arbitrary detentions, juvenile incarceration in military courts, continued illegal settlement building, and on and on, all this ever in plain sight for all to see to include pseudo leaders of the so-called international community. The hyper vigilant David Horovitz of The Times of Israel thinks the Pope has not thought this one through saying “Even this philo-Semitic pope, this pope who cares about the Jews, even he doesn’t get it.” Well Mr Horovitz you may wish to reconsider. It is very likely that perhaps it could be you who doesn’t ‘get it’. A bit rich in light of Netanyahu’s statement. There will no Palestinian State under his watch. Take heed Ms Samantha Power: Israel has no intentions, neither has it never had any intentions to compromise or negotiate. Period. 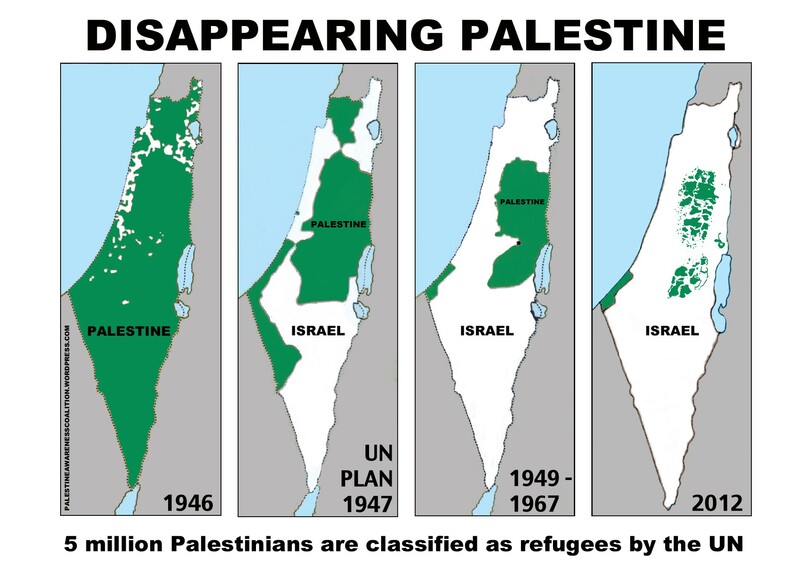 Simple research will confirm that former Israeli heads of state and other Israeli officials have all made it clear: there can never be a State of Palestine. Such simpe reseacrh will lead to readily available information. This information is in the public domain, and has been for a very long time. A visit to your Congressional library will provide much irrefutable evidence that a people lived, had lived, and were living in land with a people long before Israel created itself in the dead of the night on the back of murder and ethnic cleansing. Israel will never concede lest it be brought short and made to, particularly if leaders in the west were to enforce the letter of the law and especially the Geneva conventions in regard to ongoing war crimes for a start. Nonetheless, the momentum for a two state solution continues to grow exponentially. There will be a State of Palestine. The published letter stated in part that “Mr Netanyahu expressed various views on Palestine in and around the recent election campaign, most of them cold to the concept of an independent Palestinian state. We are convinced in our own minds that he has little intention of negotiating seriously for a two state solution within the term of this incoming Israeli government. We also have low confidence that the US Government will be in a position to take a lead on fresh negotiations with the vigour and the impartiality that a two state outcome demands.” Straight forward. Spot on. In a wide ranging interview with the Pan-Arab Asharq Al-Awat, as reported by Mina Al-Oraibi, president Barack Obama said “I will never give up on the hope for peace between Israelis and Palestinians, and the United States will never stop working to realize that goal. As I said when I visited Ramallah two years ago, Palestinians deserve an end to the occupation and the daily indignities that come with it; they deserve to live in an independent, sovereign state, where they can give their children a life of dignity and opportunity.” Well Mr President, is the price paid by generations of internally and externally displaced Palestinians not heavy or high enough? Palestinians are not responsible for the pogroms. Palestinians are not responsible for the persecutions. Palestinians are not responsible for the holocaust. These atrocious acts were all historically perpetrated by white, European, Christians. Conversely Arabs, Muslims offered sanctuary, refuge and protection as well as high office to generations of fleeing white, European, Jews. Why are Palestinians made to bear the full burden of righting historic wrongs for which they bear no responsibility? Arabs whether Muslim, Christian or Jewish lived harmoniously side by side in Palestine prior to Israel’s creation. According to the Palestinian Association for human rights, “the IDF arrest[ed] Palestinian children on a regular basis. Israeli Police, Israeli army and Israeli Secret Service personnel conduct the arrest and interrogation of Palestinian children on a daily basis. The arrests and subsequent interrogations in detention centres operate in isolation of any transparent rules, procedure or laws giving Israeli military personnel wide powers during this phase.” Such is the behaviour of the only democracy in the Middle East! A definition of resistance “The refusal to accept or comply with something.” All people have a legal right to resist an occupier using all and any means available to do so. In regard to the case of Palestine’s struggle for self determination this is no different. Members of the resistance in occupied France used everything they could to liberate their country from the Nazis. Resistance is as resistance does, “resisting authority, especially in an occupied country.” In the case of the illegal occupier Israel, resistance can be defined as exhibibing a reduced mental capacity to embrace or accept change. This use of language neither addresses the collective pain of the Palestinians, nor the obdurate resistance of Israel to comply with international human rights law and the laws governing war Jus ad Bellum/Jus in Bello. Yet it, language, provides Palestinian supporters with a powerful tool based as rightly affirmed in international law.